Scorpio has a presence you can feel and a tone in their voice that says "don't get too comfortable with me." 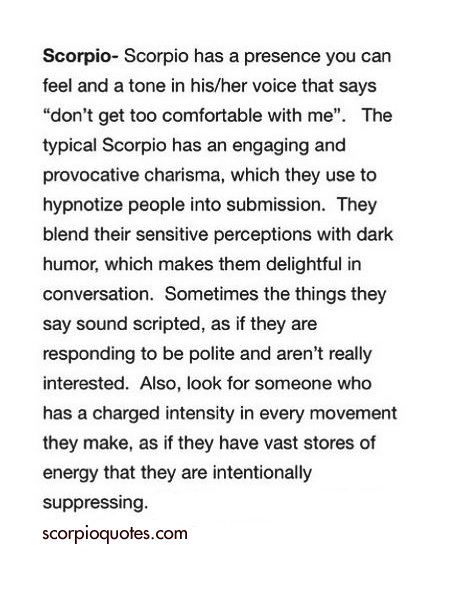 The typical Scorpio has an engaging and provocative charisma, which they use to hypnotize people into submission. They blend their sensitive perceptions with dark humor, which makes them delightful in conversation. Sometimes the things they say sound scripted, as if they are responding to be polite and aren't really interested. Also, look for someone who has a charged intensity in every movement they make, as if they have vast stores of energy that they are intentionally supressing.